Expect this to happen, a lot! 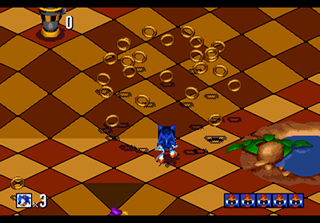 Long before 3D Sonic games were all about bad camera angles, unreliable homing attacks and Big The Cat types, their main focus was on impeccable timing and awesome music – Sonic 3D was no exception! Before being ported to the good old Sega Saturn to join the likes of Sonic R and Sonic Jam, this legendary 3D platformer shocked the world with its isometric camera angles and diverse gameplay. Little did we know that Sonic 3D would end up proving to be one of the most challenging games in the blue hedgehog’s career! Nodding its head to the formidable platforming elements found in Snake, Rattle and Roll, Sonic 3D was a tough cookie of a game that required a keen eye for detail and a lot of patience! Successfully landing on a single platform would involve you judging distances and keeping a close watch on our blue hero’s shadow, whilst defeating enemies required a high level of both skill and patience. This game ultimately waved goodbye to easy boss fights and put a stop to speedily making your way through linear zones. Special stages were somewhat familiar as you were thrown into a pre-set path that involved jumping over spiky obstacles and surviving with enough rings to earn yourself a brand spanking new chaos emerald. However, entering a special stage was a whole new ball game. Instead of simply finishing a stage with 50 rings and jumping into another dimension, you would have to hunt down your two-tailed sidekick or Knuckles and deliver a requested amount of rings to them. This was a superb way of forcing you to explore each and every zone and it definitely increased the games overall play time. The main aim of Sonic 3D was to relentlessly seek out and destroy Robotnik’s mechanical monstrosity’s and free the poor little flickies that were trapped inside. Sound familiar? Sure, but the twist was that you couldn’t possibly progress further into the game without first rescuing all flickies in the current stage. Easy as it sounds, once you had reached Spring Stadium the games difficulty increased by ten fold as it became a quest to keep your flickies free of harm – no easy task when danger was lurking around each and every corner! Despite Sonic 3D’s development falling in the hands of Travelers Tales, Jun Senoue’s handy work still played a part in the games final product. Equipped with two separate soundtracks, Sonic 3D was a collection of catchy mellow rythms and pumped up trance – of course this was dependant on which system you owned it on. 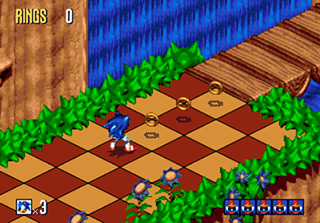 The Sega Saturn version boasted the most impressive sounds and graphics, whilst the Mega Drive was pushed to its capabilities with memorable stage music and never before seen visuals. Unfortunately, Sonic 3D’s reign over the platforming genre is long gone, but such an innovative masterpiece will remain in the heart of every 90’s kid for years to come. Fantastic music, challenging boss fights and plenty of exploration to be had, what’s not to love? !